Harris, a California Democrat, is the fourth woman to launch a bid. California Sen. Kamala Harris announced Monday that she will run for president in 2020, joining an increasingly crowded field of Democrats seeking to challenge President Donald Trump. 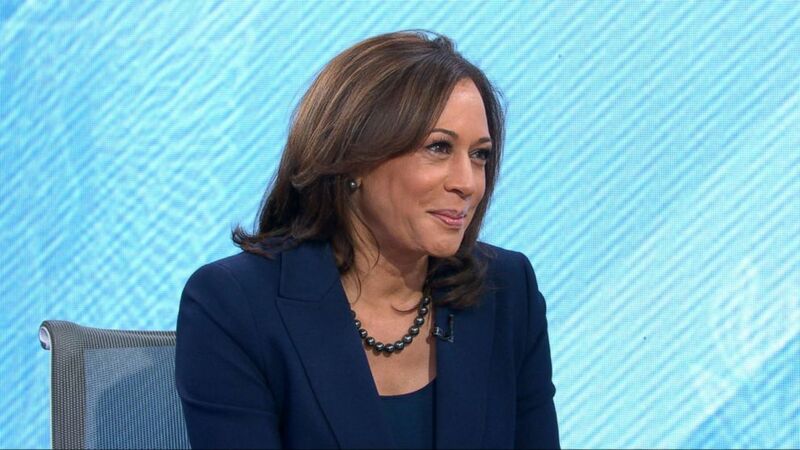 Harris' announcement, made on "Good Morning America," comes following months of speculation surrounding the Democrat, a rising star in the party who was elected California's junior senator in 2016 after two terms as the state's attorney general. "I love my country. I love my country," she said. "This is a moment in time that I feel a sense of responsibility to stand up and fight for the best of who we are." The bid for the presidency puts Harris in a position -- should she emerge from the Democratic field and defeat Trump -- to become the first woman and woman of color to ascend to the nation's highest office. (ABC News) Kamala Harris appears on "Good Morning America," Jan. 21, 2019. Less than two weeks ago, Harris, 54, said she was not yet ready to make an announcement about a possible campaign. In the interim, at least three serious contenders declared their candidacies or interest in running, including Sen. Kirsten Gillibrand, D-N.Y., Rep. Tulsi Gabbard, D-Hawaii, and former Housing and Urban Development Secretary Julian Castro. Sen. Elizabeth Warren, D-Mass., earlier announced that she was forming a presidential exploratory committee. As part of her announcement, on Martin Luther King Jr. Day, Harris cited the civil rights leader as an inspiration, saying that she seeks to continue his fight to make the country better. "The thing about Dr. King that always inspires me is that he was aspirational. He was aspirational like our country is aspirational. We know that we've not yet reached those ideals. But our strength is that we fight to reach those ideals," the senator said. "So today, the day we celebrate Dr. King, is a very special day for all of us as Americans and I'm honored to be able to make my announcement on the day we commemorate him." 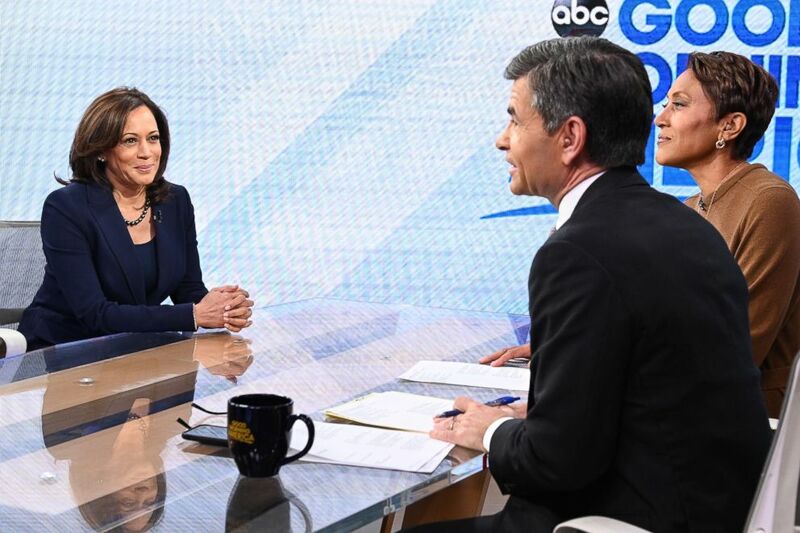 (Lorenzo Bevilaqua/ABC) Senator Kamala Harris appears on "Good Morning America," Jan. 21, 2019. In interviews earlier this month coinciding with the release of her memoir, Harris explained that she was empowered at a young age with the disposition to take personal responsibility to address the hardships she encountered, an attribute that appears to be part of her pitch to voters. "I was raised that, when you see a problem, you don't complain about it, you go and do something about it," she said on "Good Morning America" on Jan. 8. On Monday, Harris further explained that she believed the American people were looking for a commander in chief with "leadership skills, experience and integrity," who will "fight on their behalf." "On all of those points, I feel very confident about my ability to lead," she said. "I feel very confident about my ability to listen and to work on behalf of the American public. The American public wants a fighter, and they want someone that is going to fight like heck for them and not fight based on self-interests. I'm prepared to do that." Though Harris is widely portrayed as a progressive member of the Senate and has staked out positions on a number of issues aligning herself with the liberal wing of the Democratic party, she has recently faced some criticism over her tenure as California's attorney general -- a portion of her career during which Harris has said she was a "progressive prosecutor." "Time after time, when progressives urged her to embrace criminal justice reforms as a district attorney and then the state’s attorney general, Ms. Harris opposed them or stayed silent," wrote Lara Bazelon, a University of San Francisco law professor, in a New York Times op-ed last week. "Most troubling, Ms. Harris fought tooth and nail to uphold wrongful convictions that had been secured through official misconduct that included evidence tampering, false testimony and the suppression of crucial information by prosecutors." Bazelon goes on to write that if Harris "wants people who care about dismantling mass incarceration and correcting miscarriages of justice to vote for her, she needs to radically break with her past," and encourages her to "apologize to the wrongfully convicted people she has fought to keep in prison and to do what she can to make sure they get justice." On Monday, Harris released a video in which she explains her interest in launching a campaign, detailing values such as "truth, justice, decency, equality, freedom [and] democracy," which she says are "all on the line now." "The future of our country depends on you and millions of others lifting our voices to fight for our American values. That’s why I’m running for president of the United States," Harris says in the video, titled "Kamala Harris: For the People" -- the theme of her campaign. "I’m running to lift those voices. To bring our voices together." The senator further invites viewers to join her in Oakland, California, on Sunday, in what Harris' staff say will be the campaign's official launch. Though she has served only two years in the Senate, Harris has drawn interest from Democrats for her trenchant examinations on the Senate Judiciary Committee, particularly during last year's Supreme Court confirmation hearings for now-Justice Brett Kavanaugh. Both the Kavanaugh hearings and recent sessions with attorney general-nominee William Barr and acting EPA administrator Andrew Wheeler, became high-profile opportunities for senators with rumored 2020 interest to capture public attention. In addition to Harris, Sens. Cory Booker, D-N.J., Amy Klobuchar, D-Minn., and Bernie Sanders, I-Vt., all drew their share of praise from party loyalists. 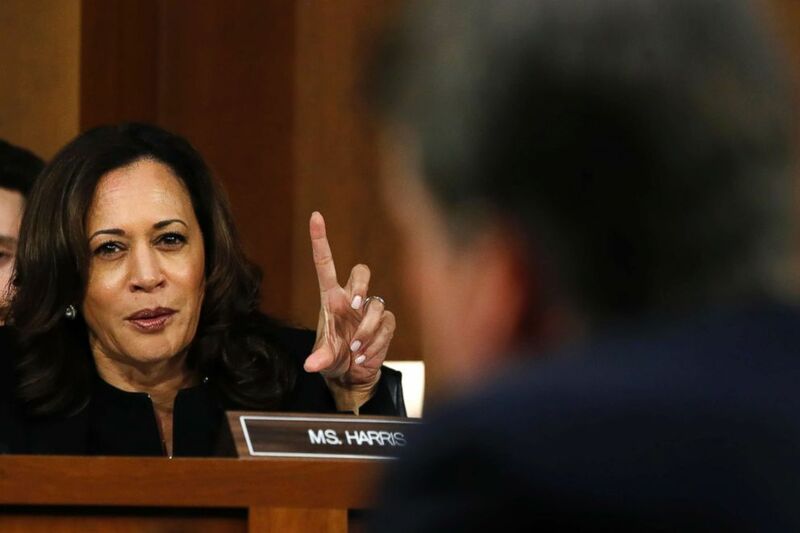 (Jacquelyn Martin/AP, FILE) Sen. Kamala Harris questions President Donald Trump's Supreme Court nominee, Brett Kavanaugh, on the third day of his Senate Judiciary Committee confirmation hearing, Sept. 6, 2018, on Capitol Hill in Washington, DC. Following the record number of women and candidates of color elected during the 2018 midterm elections, Harris -- who was born to an Indian mother and Jamaican father -- was repeatedly floated as a presidential candidate who could similarly represent the increasing diversity of the United States. Asked earlier this month whether the country was ready for a woman of color to be president, Harris was unequivocal and expressed optimism. "Absolutely," she said, adding, "We need to give the American public more credit ... we have so much more in common than what separates us." Despite waiting until Monday to make her official announcement, Harris is no stranger to the early states where she will soon campaign. In 2018, the senator visited Iowa and South Carolina to stump for local candidates. It's also likely she could spend significant time in her home state of California, which moved up its primary to Super Tuesday in March 2020 in the hopes of playing a more significant role in the nominating process. The Martin Luther King Jr. Day holiday portends to be a busy one for both those who have already thrown their hat into the Democratic primary ring and a number of potential candidates. At least seven high-profile Democrats are attending events commemorating the holiday across the country Monday, including former Vice President Joe Biden and former New York City Mayor Michael Bloomberg, who will be attending a National Action Network breakfast in Washington, D.C.
Booker and Sanders will also speak at a rally at South Carolina's state house, and Castro, the former mayor of San Antonio, is marching in the city's Martin Luther King Jr. Day parade.